The Knesset has approved a motion to strip Arab MK Zoabi of certain privileges after she participated in a flotilla to Gaza. 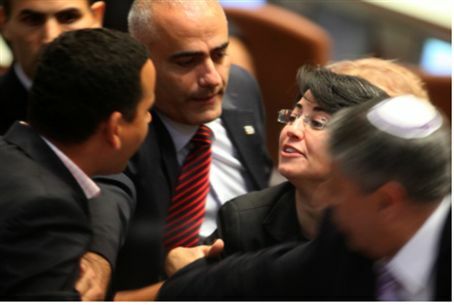 The Knesset agreed Tuesday evening in a 34-16 vote to strip freshman MK Hanin Zoabi (Balad Party) of three privileges. The move was a response to the Arab-Israeli Zoabi's participation in a flotilla that attempted to dock in Gaza in defiance of Israel's naval blockade of Hamas. Zoabi has lost the following privileges: use of a diplomatic passport, government participation in legal fees, and enhanced freedoms regarding international travel. Following the vote, Zoabi and her fellow anti Zionist Balad party MK Jamal Zahalka nearly came to blows with Kadima MKs Yoel Hasson and Carmel Shama. Knesset workers intervened to subdue the argument. During the stormy three-hour debate that preceded the vote, MKs from the political Right accused Zoabi of being “a traitor” whose loyalties do not lie with Israel. MK Yariv Levin, head of the Knesset's House Committee, said Zoabi does not belong in the Knesset. Levin expressed satisfaction with the results of the vote. “This decision reflects the general public's desire to deal harshly with MKs who bring harm to IDF soldiers and cast doubt on our very right to live here,” he said. "MK Zoabi now knows that she will have to pay a real price for her behavior,” he added. Zoabi took part in an activist flotilla that accused Israel of causing a humanitarian crisis in Gaza and sought to actively defy the Israeli naval blockade on Hamas. Zoabi was a passenger aboard the Mavi Marmara, a ship that carried members of the Turkish terrorist front group IHH, and did not carry humanitarian aid. As IDF commandos boarded the Marmara to turn it away from Gaza, they were attacked and seriously wounded by IHH members, who managed to drag three of them below deck. Soldiers opened fire in response, killing nine Turkish citizens. Following the incident, Zoabi gave media interviews in which she accused Israel of failing to provide wounded activists with medical attention, and referred to the blockade of Hamas and the Israeli presence in Judea and Samaria as “the big crime of Israel.” She also stated that she was “not at all” sorry for having participated in the flotilla, and would do it again. The Arab nationalist political party, Balad, which Zoabi represents, states that its purpose is to transform Israel into a binational state rather than a Jewish one. Although banned by the Central Elections Committee from participating in the Knesset elections in 2003 and 2009, the second time by a vote of 26 to 3, the Supreme Court overturned the bans both times, allowing the party to sit in the Knesset. Former head of the party, ex- MK Azmi Bishara, resigned from the Knesset and fled the country after being accused, among other things, of aiding Hizbullah during the 2006 Lebanon War.